Text Area Resizer - Give yourself room to type! "Web 2.0" is the term that's been coined to indicate the vast shift to user-generated, social content on the internet. That means hundreds of millions of users are out there composing text, image, and video content for websites - and they're doing that composition on the websites themselves. To make this easy, site designers need to make sure that the content-generation experience is as smooth as possible - but some are still stuck in Web 1.0 design principles. One telltale sign: a text box too small for the content it's going to receive, which leads to lots of scrolling and a frustrated user. 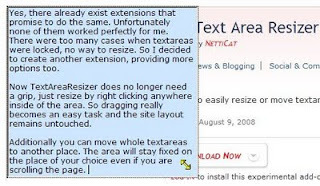 NettiCat comes to the rescue with a text-area resizer extension for Firefox, letting users pull, stretch, and move the text box any which way they like. And hey - users improving sites with add-ons, that's Web 2.0 in action itself! The system works!! Heh, or you could just use Safari, which has had this feature for what feels like years.